The President of Bolivia (Spanish: Presidente de Bolivia) officially known as the President of the Plurinational State of Bolivia (Spanish: Presidente del Estado Plurinacional de Bolivia), is head of state and head of government of Bolivia. According to the current Constitution, the president is elected by popular vote to a five-year term, renewable once. In 2016, in a referendum the country voted to maintain term limits. Since 2009, if no candidate wins a majority, the top two candidates advance to a runoff election. Prior to 2009, if no candidate won half the popular vote, the president was chosen by a vote in a joint legislative session from among the top two candidates (prior to 1995, the top three candidates were eligible). The current President of Bolivia is Evo Morales, since 22 January 2006. He was elected in 2005, and reelected in 2009 and again in 2014. On 17 October 2015, Morales surpassed Andrés de Santa Cruz's nine years, eight months, and twenty-four days in office to become the president with the longest unbroken term in office. 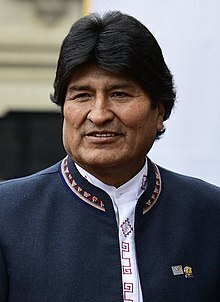 Morales surpassed Víctor Paz Estenssoro, who previously served as the longest-serving president with just over 12 years in office, but these terms were nonconsecutive. During its more than 192 years of independence, Bolivia has been ruled by the military leaders who fought for independence, the leaders of the War of the Pacific, representatives of the aristocracy, and democratically elected leaders. Also, the history of the presidency has involved civil wars, more than 190 coups and violence. Different titles have been used, such as "Liberator of Bolivia" (used by Simón Bolívar and Antonio José de Sucre), and "Supreme Protector" (by Andrés de Santa Cruz). The following table contains a list of the individuals who have served as President of Bolivia. Alberto Díez de Medina . (1882–1943) José L. Lanza . Luis García Meza Tejada . In 1983, a poll was taken by the newspaper Última Hora to determine which seven historical presidents were regarded as most significant. The "winners" were Antonio José de Sucre, Andrés de Santa Cruz, Manuel Isidoro Belzu, Mariano Melgarejo, Aniceto Arce, Ismael Montes, and Víctor Paz Estenssoro. In the event of the death or permanent incapacity of the President, the Vice President of Bolivia would assume the office. The President of the Senate and the President of the Chamber of Deputies are third and fourth in the line of succession. In the 2005 political crisis, with all of these positions exhausted, Eduardo Rodríguez Veltzé, the Chief Justice of the Bolivian Supreme Court, assumed the presidency. Under the 2009 Constitution, however, the assumption of power by the President of the Chamber of Deputies automatically precipitates an election within 90 days. In the case of temporary incapacity or absence from the country, the title of Acting President (Spanish: Presidente en ejercicio) is transferred to lower officials according to the order of presidential succession. In September 2012, Senate President Gabriela Montaño became the first woman to assume this office since the presidency of Lidia Gueiler Tejada. ^ "The World Factbook — Central Intelligence Agency". www.cia.gov. Retrieved 6 April 2017. ^ Casey, Nicholas (24 February 2016). "Bolivian President Concedes Defeat in Term-Limit Referendum". The New York Times. ISSN 0362-4331. Retrieved 1 April 2017. ^ Quiroga T., José Antonio (11 October 2015). "Andrés de Santa Cruz y Evo Morales". Página Siete. Retrieved 23 June 2016. ^ "Artículo 169: En caso de impedimento o ausencia definitiva de la Presidenta o del Presidente del Estado, será reemplazada o reemplazado en el cargo por la Vicepresidenta o el Vicepresidente y, a falta de ésta o éste, por la Presidenta o el Presidente del Senado, y a falta de ésta o éste por la Presidente o el Presidente de la Cámara de Diputados. En este último caso, se convocarán nuevas elecciones en el plazo máximo de noventa días." "Segunda Parte, Título II, Capítulo Primero". Nueva Constitución Política del Estado (PDF). pp. 36–37. Archived from the original (PDF) on 21 May 2009. Retrieved 12 February 2009. ^ Corz, Carlos (23 September 2012). "Montaño asume la Presidencia interina de Bolivia, Evo va a la ONU y hablará del mar". La Razón. Retrieved 24 September 2012.